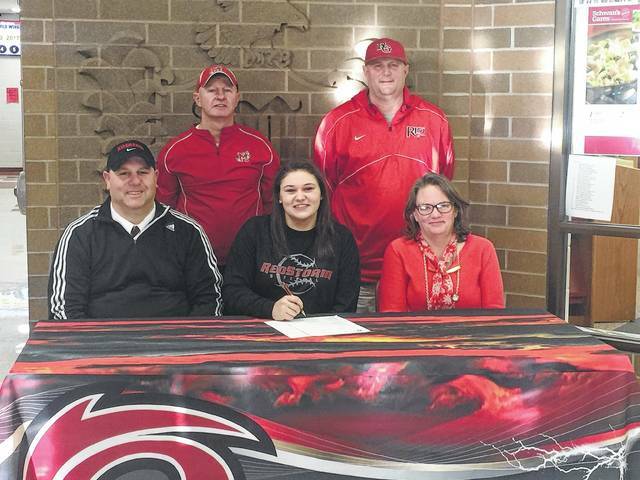 Minford’s Mary Pica signed with Rio Grande earlier in the winter. Pica will finish her career as a four-year starter for the Falcons. It’s always an excellent feeling when a humble, hungry, and hardworking individual receives an opportunity to perform on a bigger stage — whether it be in academics, athletics or the arts. For Mary Pica, her work in the classroom and on the softball field has paid major dividends as the senior infielder signed a letter of intent with Rio Grande to further her education and her softball career. However, Pica knows that it’s something that she couldn’t have accomplished without the support of her family, friends, and coaches that have helped push and prod her to bigger and better things. In Preston Messer’s eyes, Pica is a figure that will definitely be missed around the Minford clubhouse. After playing a significant role on a team that made a district semifinal run in her freshman season with the Lady Falcons, Pica moved into the heart of the Minford order as a sophomore and hasn’t looked back since. Over the past two seasons, Pica, who has proven to be an all-around utility player in the field, has turned into one of the most lethal hitters in the All-Southeast District from her cleanup position, as the senior has provided a strong bat that can hit for contact or power. That’s been proven in the accolades that the senior has obtained over the past two years, as Pica notched First-Team All-Southern Ohio Conference and Division III First-Team All-Southeast District honors in her sophomore and junior seasons, with the multi-talented infielder adding Division III All-State Honorable Mention accolades in the latter of the two years. Through her own playing abilities and accomplishments, which included Second-Team All-SOC honors, fellow friend and middle-of-the-order counterpart Ariel Kingery has also obtained a scholarship to rival Shawnee State University. Pica is excited about the possibilities and opportunities that those matchups will provide. While the matchups will be intriguing with the two friends— along with Kelsey Conkey, Rio Grande’s ace in the circle — playing at rival schools, the matchup also presents a good opportunity for Messer to see what will be his former stars in the middle-of-the-order. At Rio Grande, Pica will be joining a program that has been on a fast rise up the NAIA ladder. The RedStorm, behind the leadership of Conkey in the circle, have obtained a 16-6 record and sit in the 24th position in the latest NAIA poll in 2017, and finished 41-9 en route to winning the Kentucky Intercollegiate Athletic Conference — now the River States Athletic Conference — title last season. Rio Grande has accumulated a 119-51 record over the past four seasons. Like the program, however, Messer believes that the RedStorm are getting a winner. But Pica knows that it isn’t possible without the support of the family, friends, and coaches that have helped her along the way.